Menopause is a natural transition all women will experience. It is perhaps not surprising, then, that there are many myths and old wives' tales regarding menopause have cropped up over the years. Some of these myths relate to menopausal depression, and can often make it confusing for women to navigate through the swathes of advice. If you are finding it difficult to separate fact from fiction, then keep reading to learn more about the myths and facts about menopausal depression. Even though it is a common symptom, not all women going through menopause will suffer from depression. In fact, the vast majority of women don't suffer from menopausal depression as a symptom, although there are many who suffer from low mood as a secondary effect of other uncomfortable menopause symptoms or as a result of fluctuating estrogen levels, which can have a negative impact mood. Estrogen regulates the natural mood elevating neurotransmitters, endorphins and serotonin. Therefore, menopause can cause mood disruptions or even depression, if left unaddressed. The likelihood that a woman will experience depression due to menopausal hormonal imbalance depends on her family history and sensitivity to hormonal changes. A woman's experience of the condition will depend on her individual physiology, general health, and family history. Some will experience chronic sadness, whereas others might have panic attacks. These symptoms are also related to other reasons for menopausal depression, which can be painful or distressing symptoms of menopause (e.g., hot flashes, sleep problems, anxiety, and vaginal dryness) and stressful life events, such as aging parents and children leaving home. Although not everybody suffers from it, depression during menopause is real for many women, and it can affect daily life. Reasons for its onset are numerous, and they include hormonal, genetic, and lifestyle factors. There are many medical ways to treat the condition. The first step should typically be self-help remedies. These are the cheapest and safest option, and the effects are more likely to last. A few simple changes to lifestyle - such as exercising more often, reducing alcohol consumption, and getting more sleep - can all help combat the condition, especially when combined with hormone therapy. 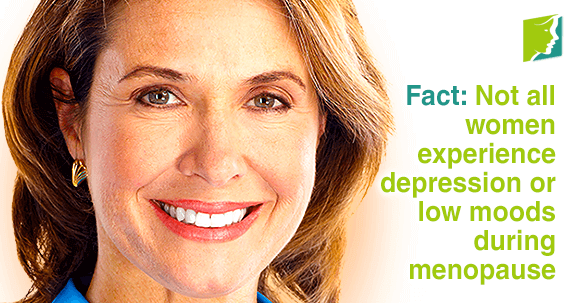 There is hope for sufferers of menopausal depression. Many women find it goes away after menopause, but for some, it can be longer lasting. For this reason, it is important to talk to a doctor as soon as you feel that menopausal depression is developing, and not just assume it is inevitable and nothing can be done.